I am Nelson Rodriguez, Accountant, Enrolled Agent (EA). Licensed to practice before the Internal Revenue Service (IRS). Registered Tax Return Preparer (RTRP). Certified QuickBooks Pro-Advisor. Notary Public. I may assist you in the collection, analysis, and presentation of financial information. 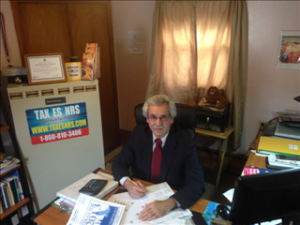 As an Enrolled Agent, I may complete your business or individual Income Tax Return. I may help in Tax Planning and Management. Represent you or your business before the IRS. Issues covered: IRS Examinations, Removal of Liens on Property, and Negotiations with the IRS, among others. Enjoy the comfort and peace of mind you deserve. Take care of business while having a trained professional helping you in obtaining timely, accurate, and reliable information. It enables you to make better decisions, increase profits and cash flow and reduce tax liabilities. At Nelrodsanson, LLC I take pride in working efficiently and effectively to achieve excellence. I help my clients handle their personal finances or their business operation. The clients have the right information they need to be well informed at the time of setting goals and making decisions. Click Here to learn more about us or check out Our Services page for more information.